Leaving Udaipur behind, we boarded an overnight train bound for Delhi. Curious to see how first class compares to second and third, we had purchased tickets for a first class sleeper car. As luck would have it, we were assigned one of only two private berths on the entire train. The train car felt luxurious especially compared to our most recent bus journey. After a restful night of sleep we pulled into one of Delhi’s train stations early in the morning and made our way to a restaurant just outside the entrance. We had hours to kill before our flight to Varanasi so we ordered dosas and chai, doing our best to wake up before heading to the airport. 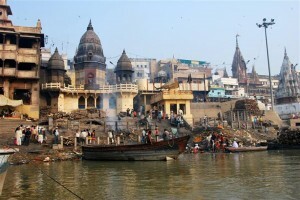 If there’s any place in India that we had reservations about visiting, it was Varanasi. 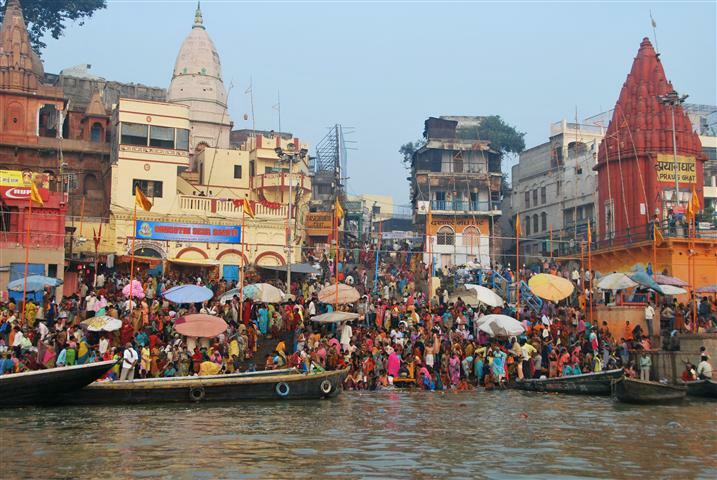 One of the world’s oldest continually inhabited cities, Varanasi is also India’s holiest city. 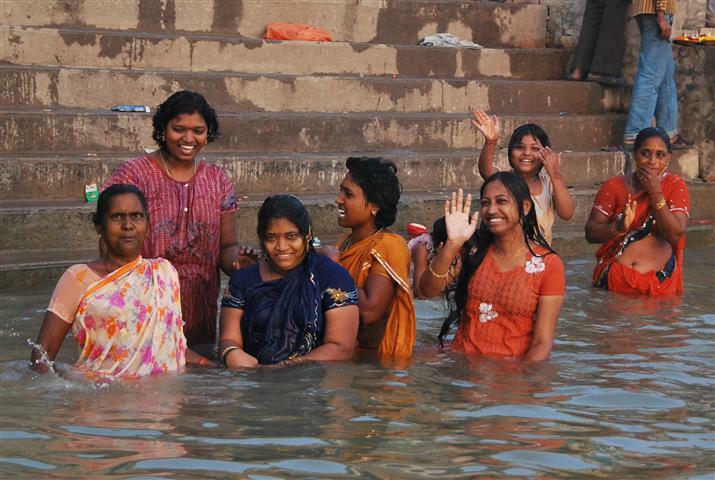 Hindus believe that if they bathe in the river, their sins will be washed away. If they die in Varanasi, they will reach Nirvana. 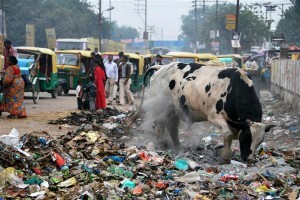 But India’s spiritual epicenter is anything but serene or tranquil. We had been told to prepare ourselves for a chaotic, noisy and filthy place. 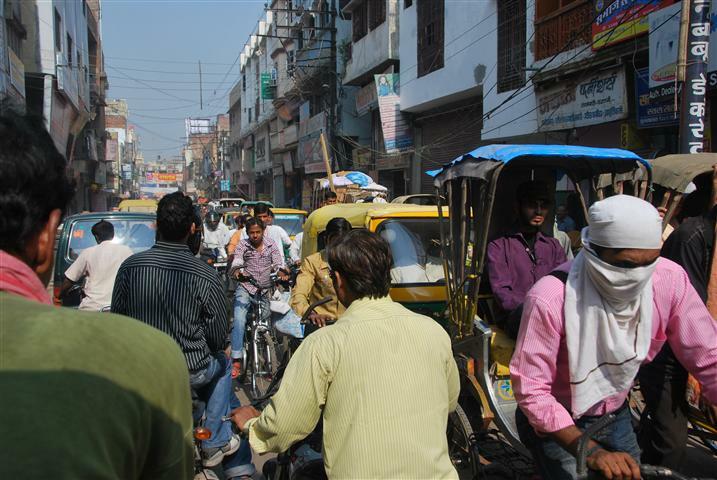 Some travelers we met loved their time in Varanasi while others couldn’t wait to get out. Regardless of whether or not they enjoyed their visit, people seemed to generally agree that it was a memorable experience and one worth having. By the time we reached Varanasi, we had been traveling for nearly 24 hours so we were eager to settle in at our hotel. Unfortunately Varanasi’s airport is one of the tiniest airports we have ever encountered. It was definitely not equipped to handle the two flights that landed at about the same time that afternoon. After landing we learned that we were visiting just days before the new, larger airport was scheduled to open. As I took refuge in a corner, Jason made his way through the sea of people and attempted to locate our bags on the airport’s one and only luggage carousel. Bags in hand, we exited the terminal and spent way too much time trying to negotiate a fair price for the ride to our hotel. Tiring of the negotiations we finally chose one of several eager drivers and settled in for the 45 minute ride into the city. Along the way we encountered something that has never happened to us before. The taxi driver actually pulled over to pick up two of his friends standing on the side of the road. I’m not sure who benefited more: the two men who got a free ride home from work that day or Jason and me who had plenty to keep us entertained as we watched the three men squished into the front seat, talking animatedly. We intentionally made no plans for our time in Varanasi. Like our visit to Jaisalmer, we wanted to spend our days wandering, eating good food and simply taking it all in. There was certainly more than enough to keep us occupied. The Old City is a maze of alleyways which can be difficult to navigate due to the ridiculous amount of foot traffic in such a narrow space. Pedestrians also have to be mindful of the occasional person flying by on a motorbike, funeral processions, or holy cows that sometimes fill the entire path. Some of the cows have such sharp horns that it makes meeting them in the middle of a dark alley a scary prospect. Given the Old City’s claustrophobic alleys, we chose to spend most of our time in Varanasi on the river. 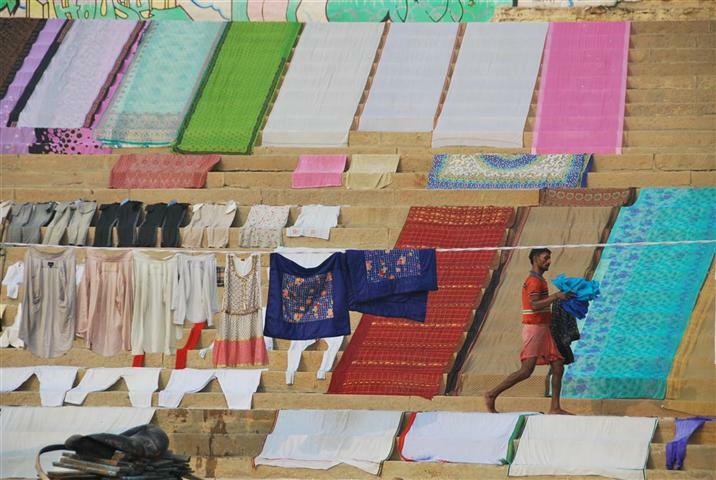 The atmosphere along the ghats is colorful, bustling and exciting. Walking along the river, we saw pilgrims in the lotus pose sitting quietly with their eyes closed, kids squealing and jumping into the water, and people bathing, brushing their teeth and doing laundry. It’s difficult to imagine a more interesting place to people watch. One of our most intense experiences was a visit to the Manikarnika burning ghat where up to 200 people are cremated each day. The funeral processions we encountered in the alleys all eventually end up here where loved ones are washed in the Ganges and placed on a funeral pyre. Young men hoping to make a little money often stand around the ghat offering to explain the cremation ritual. 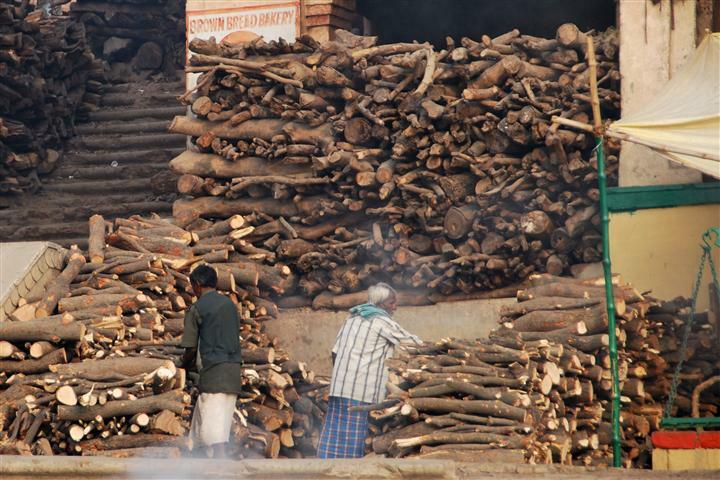 We learned from one of these men that the price of the cremation is dependent upon the type and amount of wood used. The eldest son, brother or husband sprinkles ghee on the pyre and sets it alight with a torch. Once the burning is complete, the chief mourner and others douse the pyre with water from the river. 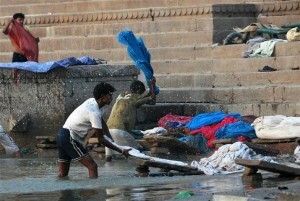 They then gather the ashes in an urn and empty the remains in the Ganges. 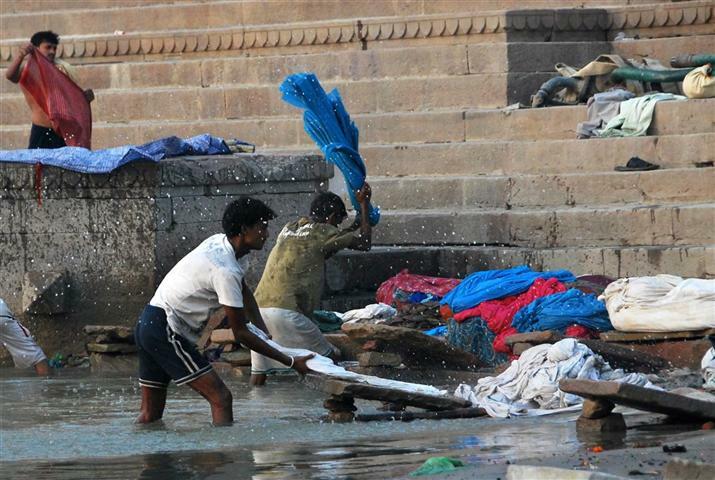 We did not see any women at the burning ghat as they apparently pay their final respects at home. We also found it interesting that a subset of Hindus cannot be cremated here, including sadhus, lepers, children under five, pregnant women and snake-bite victims. Instead their bodies are taken in a boat to the middle of the river, tied to a stone and sunk to the bottom. We did not spend much time at the burning ghat as I felt it was difficult to watch the bodies burning and see the families mourning. It was such a personal moment for them and it felt like a bit of an invasion of their privacy to stand around staring. 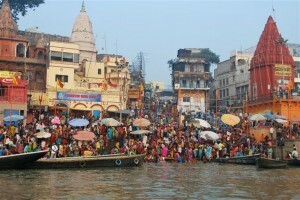 Given the crowds along the city’s ghats, the easiest way to see Varanasi is from the water. Twice during our four days in the city, we woke well before sunrise and headed down to the river for a boat ride. As our boat driver paddled, we sat in silence and watched the pilgrims as they gathered along the ghats to partake in their daily prayer rituals. 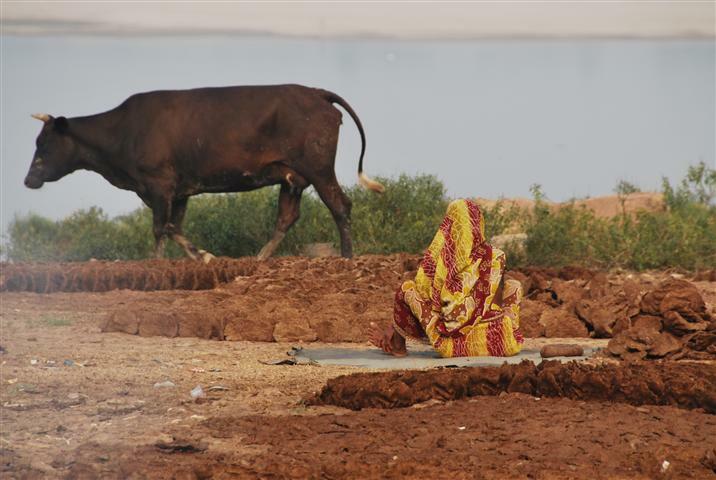 Some remove most of their clothing before immersing themselves in the water while others stand knee deep along the banks, splashing water over their bodies. We saw groups of people chatting and laughing while others quietly went about their business. These morning rituals were fascinating to watch but it was unsettling to think about the contamination levels in the river. 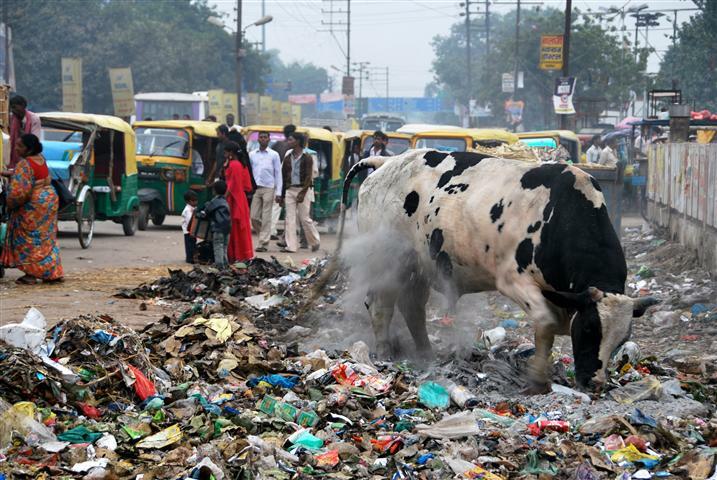 People were not only bathing just steps away from piles of garbage and cows but we also saw people brushing their teeth and drinking the water. It’s been over a year since we were in Varanasi and I still cringe when I remember the bloated animal corpses that we saw floating in the water, only feet away from where people were bathing. According to our trusty Lonely Planet, every day about 60,000 people go down to the Varanasi ghats to take a dip in the river. Along this same stretch of river, 30 large sewers are continuously flowing into the water. As you might expect, bacteria levels in the river are off the charts. After four days of doing little more than people watching and eating delicious food, we packed up our bags and headed to the train station for the final leg of our Indian journey. Next time I’m in India, I doubt I’ll rush back to this colorful, crazy city on the Ganges but I definitely appreciated the experiences we had while visiting. Like so many travelers before me, my time in Varanasi certainly left an indelible mark. By some cruel trick of time over a year has passed since the last MiniBlog post. Look left for the latest post on Buenos Aires, and be sure to check out new photos from India and Argentina in the Gallery. Check out photos from Jodhpur and Udaipur in the Gallery, or directly in Picasa. Keep your eyes peeled for the picture documenting the pinnacle of commode design, with accommodation for both Asian and western tastes. After a five day delay in Mexico City we finally made it home to Wisconsin on February 5. Just over two weeks later we packed our bags once again, this time bound for San Francisco! We’re still planning to continue with our blog posts, and although we haven’t made too much progress you can check out the first set of photos from India in the Gallery or directly in Picasa.